This is a re-publication of two posts that I did last year. I am combining them to repost this year as I really couldn't add much to what I wanted to say. I do make a memorial of my dead relatives in my home with their pictures and I will try to include a post about that later today or this weekend. Up until five years ago, I was pretty bad about praying for the dead. Too busy living I guess. When my baby Raphael died it was a real reminder that this time on earth is fleeting, and that as a Catholic we were all part of that great communion of saints. It was that belief that all of our souls, even the soul of my precious little unborn baby, were all part of God's big plan, and that someday I would be able to see my baby, and hold him and talk to him. In the meantime, it gave me comfort to know that my little one was not alone! There was family in the next life. My beloved grandparents and uncle were already there as was my mother-in-law, a beloved family friend and many others. Through God's divine mercy, the all could be together and happy throughout eternity. I've mentioned before that I found myself spending many hours in the cemetery at my baby's grave thinking about these things. 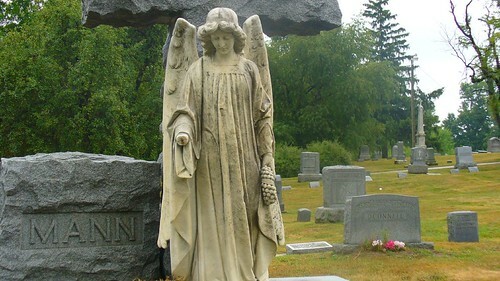 (You know you're spending a lot of time at the cemetery when you are on waving terms with the workers!) I found that I loved to pray there in baby land. Theologically it must be one of the holiest places in the cemetery with all of the relics of all these little saints and the company of all the angels commended their to protect them. 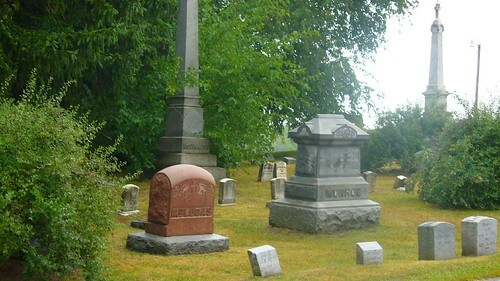 A few years later I had the opportunity to find the grave of my grandparents and my uncle. I had been there before, but I always forget exactly where they are buried. We found them. 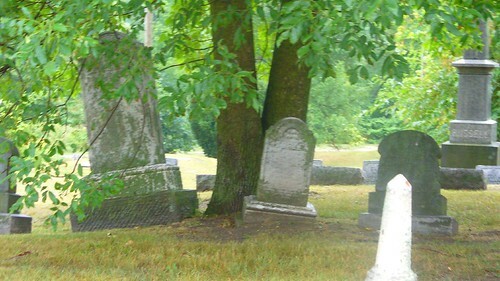 Their graves were overgrown and looked untended, uncared for and unloved. That wasn't true of course. They were still loved deeply. I know my sister and I will always have a special place in our hearts for them. Yet my practice of praying for their souls was a lot like their graves had become, untended, and uncared for. That November I made a promise to turn that around. November is a perfect time to do that as it is the month when the Catholic Church remembers all of the dearly departed. I take the pictures of all of my beloved dead relatives and friends, and put them in a prominent place so that we remember to pray for them every day during the month. I talk to the children about each one and remind them of the importance of prayer for the deceased. Last November I found a wonderful book (that I intend to review later) called Father Phillip Tells a Ghost Story (Padre Phillip Hoce Un Cuento de Fantasmas): A Story of Divine Mercy (Un Cuento de La Divina Misericordia) It's perfect for this time of year with a very "Halloween" type of feel to it, but it puts "ghosts" into their proper perspective in regard to purgatory. After reading this with my children, I was able to better explain what a poor soul in purgatory is, and how to offer up our little pains and sufferings, in a way that they could better understand. The Catholic Culture Site reminds us that we may earn indulgences for the souls in purgatory. A plenary indulgence, again applicable only the Souls in Purgatory, is also granted when the faithful piously visit a church or a public oratory on November 2. In visiting the church or oratory, it is required, that one Our Father and the Creed be recited. Eternal rest grant to them, O Lord, and let perpetual light shine upon them. Other families recite the "Eternal Rest" prayer in between decades of the rosary. From time to time, I'll get a thought in my mind of someone I use to know, who is now departed. Maybe the kid's old piano teacher, or Mr. Wolverton who use to drive us kids to band, or Uncle Harry, who really wasn't my uncle at all, but a nice friend of my grandfather's who put up with the shows my sister and I use to put on way to often. I think maybe that's a sign that I need to pray for them, or they can use those prayers for someone else. I try to say a quick prayer then. Resources for remembering the poor souls in purgatory during the month of November. Prayer for the poor souls in purgatory. A rosary for the poor souls in purgatory from Moneybags. St. John Vianney on Purgatory. Simple prayer for the poor souls that you probably didn't learn in Catholic School. Fabulous post with lots of information..